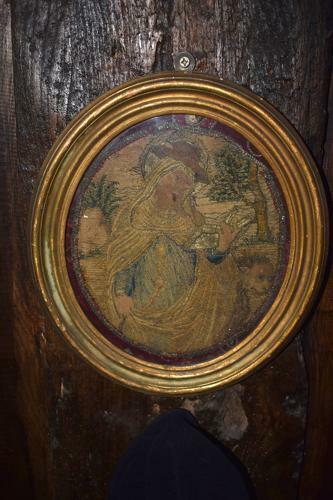 A 17th century oval needlework of Saint Gertrude the great reading a bible with a lion bedisde, worked in silk and silver and gold thread. (Saint Gertrude or Gertrude the Great (or Saint Gertrude of Helfta) (Italian: Santa Gertrude) (January 6, 1256 – c. 1302) was a German Benedictine nun, mystic, and theologian. She is recognized as a saint by the Roman Catholic Church, and is inscribed in the General Roman Calendar, for celebration throughout the Latin Rite on November 16).